Ninja Warrior final tops 2 million as Seven, TEN roll over. It was a night of TV when the competition effectively rolled over and played dead. 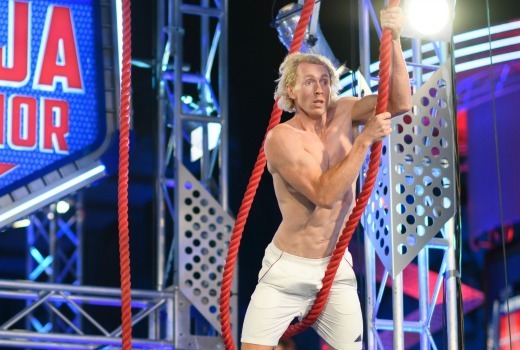 Extraordinarily, neither TEN nor Seven were prepared to offer premium content against the Australian Ninja Warrior finale, allowing Nine a free run on the ratings obstacle course. That meant Nine was able to pull a huge 2.15m for its “Final Stage” and 2.04m for the bulk of its finale, dwarfing its nearest competitor, ABC’s 7:30 on 570,000 viewers. Seven and TEN were not even on the starting mat with 369,000 for Mighty Cruise Ships and TEN’s All Star Family Feud on a dismal 210,000. Ninja Warrior becomes the highest “non-sports” title of the year, despite no contestant able to conquer the dreaded Mount Midoriyama. Nine network dominated with 44.2%, double the share of Seven’s 22.8% then ABC’s 14.7%, TEN’s 12.6% and SBS 5.7%. Outside of Ninja, best for Nine were A Current Affair (1.01m), Nine News (1.01m / 998,000) and Hot Seat (535,000 / 305,000). Movies: Edge of Tomorrow was 270,000 in 3 cities and Skyfall was 253,000 in 2 cities. Seven News (1.07m / 1.03m) led for Seven then Home and Away (713,000), The Chase (662,000 / 417,000), Mighty Cruise Ships (369,000) and Yummy Mummies (281,000 / 227,000). Ramsay’s Hotel Hell was only 227,000. ABC News (691,000) topped ABC’s night then 7:30 (570,000), Joanna Lumley’s India (529,000), Ask the Doctor (445,000) and Foreign Corespondent (306,000). The Project (540,000 / 387,000) was best for TEN followed by TEN Eyewitness News (441,0000) and Family Feud (355,000). An All Star Family Feud replay drew just 210,000 and Movie: Aloha was a paltry 145,000. Michael Mosley: Queen Victoria’s Slum (245,000), Insight (210,000), SBS World News (138,000) and Dateline (136,000) comprised the night on SBS. Shaun the Sheep showed off again with 232,000 viewers. Just caught up on the ANW finale and absolutely loved it. Yes, the course seems impossible but it’s meant to be. Very proud to see the rock climbing contingent and a strong WA representation get so far, too. Now I’m going to start aggressively training for the S2 tryouts. I don’t get the attraction of the show. I thought that your TV could only get the Ten network. Hoping against hope the contestants, with bodies unlike ours, will come a cropper and really enjoying it when they do, which is most of the time. What’s not to like? I was surprised by how much I enjoyed this show, considering I don’t like “reality”, and it was basically a more serious version of Wipeout or It’s A Knockout. Yet I was still on the edge of my seat each time someone ran the course. (Sometimes it was just as much about seeing them crash out, haha). Could have done without the commentary from the sidelines but, all in all, I think it was just that little bit different and new enough to pull in even those, like me, who aren’t into the genre. I only hope, like others have stated, Nine don’t overdo a good thing and give us too much of it, or that Seven and Ten quickly pump out imitators. In the American version they now move a specific number of the top women competitors through the rounds so there are some guaranteed in the finals. It would be good if they do that here too. It’s all well and good to say that women and men are treated equally (have to run the exact same course) but parts of the course are more geared to men than women, particularly those that rely on grip strength. Scientific studies have shown that even the most elite women athletes can’t match even mediocre men athletes on grip strength. At least giving some women a crack at the final stages would be fair, they would still have to complete the final course exactly the same. Seven’s horror Tuesdays continue, now joined by Ten. Don’t understand Ten holding Shark Tank for a week – they usually run normal programming against big events. Was it to avoid a lower season average for the show? I notice Studio 10 is now split into 3 figures. Seven have their own Ninja Warrior type show, that they’ve been sitting on since last year – Cannonball. All good points although Shark Tank would have suffered. It sort of turned farcical when it became clear that 65 seconds was the deciding factor in who would win: nobody. Interestingly, the past 3 years, the highest-rating program has each received 2.1m. Imagine the ratings if Nine combined their biggest nights of the year. No one will ever reach Mount Origami, (or whatever its called) as 65 seconds is ridiculously too short a time to conquer the obstacles and reach it. Make it 90 seconds and maybe I’ll watch it next year. 65 secs is virtually impossible. Even the very able and talented contestants such as rockclimber, Tom O’Hallaron and the young chippy with the headband and Sideshow Bob hair found it too hard. 3 mins for that first leg would be more reasonable. A real letdown for viewers when no-one even looks close to getting through that last challenge. I haven’t watched Ninja, but what a great quick hit series for ch9 to have in their pocket. It comes in and smashes the finales of their rivals shows. And a 3 week blast keeps viewers wanting more….smash & grab programming at its best. Programmers get plenty of grief on here (quite rightly most of the time), so you have to take your hats off to the ch9 crew for this epic win. The only advice from me would be to keep it short and only use it once or twice a year..
Great, now that the ‘Ninja effect’ is over, perhaps all networks will launch their new shows now? U mean Ninja/extreme obstacle course themed shows? Because that’s what will be in production from Seven as we speak… ? Was a boring ep of Ninja Warrior though. The 1st stage we’d seen before and knew that, on their 3rd go round, a few would make mistakes but most would cruise through. Stage 3 looked interesting, but nobody got to it. In this respect it looked more like the Japanese and US versions, lots of people boasting before all of them fall in the water. Took 10 minutes to watch the Stage 2 and discover that. Well I was on the edge of my tenterhooks the entire time. Great to see such a difficult final course as well. Makes you want to watch next year to see if anybody makes it. If it was easier it would definitely be boring.